The most common phone call we receive about boat slips is “How much is a boat slip in Santa Barbara Harbor?” We are happy to answer your Santa Barbara boat slip questions as it can be a bit confusing unless you’ve been at it for decades like our family. 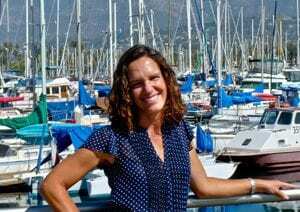 – The monthly boat slip fee paid to the City of Santa Barbara. – The transfer of the slip permit from the current permittee(s). – The one-time slip transfer fee also paid to the City. FYI: Most slips are transferred from owner to owner through the private marketplace versus the City’s slip lottery program. We will focus on private transfers in this article but are happy to answer lottery questions by phone or email. Like renting a house or an apartment, boat slips in the Santa Barbara harbor are leased on a month to month basis by the City of Santa Barbara. Harbor slip prices are based on either the size of the boat or the actual slip, whichever is greater. Thus, if you have a 22′ craft in a 25′ slip you will pay the 25′ rate. Note: the measurements are not necessarily what the boat manufacturer says. The harbor slip measurements are from the farthest points, tip to tip. So if you have an outdrive, you’d measure to the end of the drive, not the hull. If you have a bow sprit you’ll need to take that into account too. There are a few other things about slip fees worth mentioning in this article. The City assesses a late fee if you don’t pay by the 15th of the month. Visitor births are available for both recreational and commercial boats. The base rate for commercial fishing vessels is $.75/foot/day for the first 14 days. Each year slip holders will receive a yearly tax bill called the Possessory Interest Tax. This tax is approximately 1.05% of the assessed value of the slip. 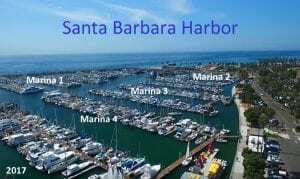 How Do I Get A Boat Slip in the Santa Barbara Harbor? Boat slips in the Santa Barbara Harbor are owned by the City of Santa Barbara and leased to boat owners. There are 4 marinas in our harbor. Marina 1 is the largest and closest to the breakwater. It is popular for Santa Barbara Yacht Club members since it is the closest to the club. It is also home to many of the harbor’s larger yachts. Marinas 2, 3 and 4 are located nearer to the main parking lot and preferred by many for easier access. Some say these docks tend to be warmer than those in Marina 1. Most of the boat slips are transferred from one leaseholder to another, often combined with the sale of a boat. The current leaseholder negotiates a price, often through Chandlery Yacht Sales, to transfer their lease rights to a new person. The fee is based on the current market value of the slip. Be prepared for some sticker shock, as boat slip permits, especially large ones, are in demand and fetch high prices. A handful (or fewer) of slips are offered to new owners by the City of Santa Barbara. This is done through a long lottery process. Rather than try to explain the harbor slip lottery process, we’ve provided a PDF download with info provided by the City. Download Harbor Slip Lottery Information. 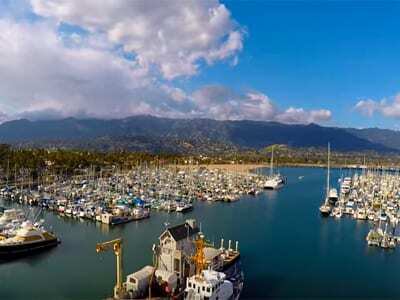 How Much Are Boat Slip Transfer Fees in Santa Barbara? When you become the new leaseholder of a boat slip in the Santa Barbara harbor, you will be required to pay a one-time slip transfer fee to the City of Santa Barbara. Boat Slip Transfer fees are a subject unto themselves and thus, we have decided to create a page that looks at boat slip transfer fees. Use the following link to read about Santa Barbara Harbor Boat Slip Transfer Fees. As you’ve read through this article you have likely discovered, leasing a boat slip in the Santa Barbara Harbor can be a complicated process. That is why so many people turn to the trusted pros at the Chandlery Yacht Sales. We’ve been transferring slips for almost as long as there has been a marina in Santa Barbara. We know the ins and outs of the process and will keep you safe and very well represented. We are constantly helping people transfer slips in or out of their names. Below is a map of some of the slips we have available. Some slips are not advertised. Give us a call and we will work with you to find just the right one for your needs. The above-mentioned rates are provided by the City of Santa Barbara and deemed accurate yet may change without notice. Please contact Chandlery Yacht Sales for the most current slip rate information.